After a rather long wait, the Samsung Galaxy Note 8 phablet owners on T-Mobile can finally enjoy the benefits delivered by the Android Oreo update. Sadly, the release notes page has not been updated by T-Mobile yet, but the update is most likely based on Android 8.0, as it happens with the other Samsung flagships that recently received the update. 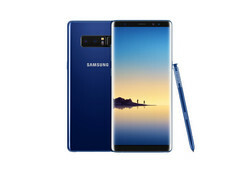 Unveiled in late August 2017 and released on 15 September, the Galaxy Note 8 is the successful follower of the ill-fated Galaxy Note 7 phablet. Although it is similar in terms of size and design to the Galaxy S8+, the Galaxy Note 8 is the first Samsung handset to feature a dual-camera setup on the back. On top of it all, Samsung installed its own Experience 8.5 UI, which is built using an Android 7.1.1 Nougat core. Unfortunately, bringing up to date the original firmware took a while, so there are still many Galaxy Note 8 units on T-Mobile waiting for the update. After all, its arrival has been unveiled yesterday and the T-Mobile software support page for the Note 8 still needs to be updated with the new info. The one coming up with the good news about the update was, as usual, T-Mobile's "product guy" Desmond Smith. Last Friday, he published a Twitter post that reads the following: "THIS JUST IN! @TMobile #GalaxyNote8 #Android #Oreo update approved! Will start hitting customers phones as early as Sunday night!!! (No April Fool's here) \m/ - Des" Although he also mentioned in one reply to a comment that the release notes will show up Sunday night/Monday, this information is not public yet. Samsung was so slow with the Android Oreo update because the Samsung Experience UI was also updated to a new version, so the Galaxy Note 8 will move from Android 7.1.1 and Experience 8.5 UI to Android 8.0 and Experience 9.0 UI. Samsung Experience 9.0 comes with multiple changes, including redesigned Quick Shortcuts, the ability to store any file type in the Samsung Cloud Drive, a GIF keyboard and a customizable toolbar in Samsung Keyboard, improved performance, a few new Edge screen features, Color Lens (this feature applies a color over the screen to eliminate the white background, potentially helping reduce eye strain), and more.